IT Service Provider Version 1 today announced the opening of its new Munster Headquarters in Cork City Centre and the creation of 40 specialist IT jobs for the region. 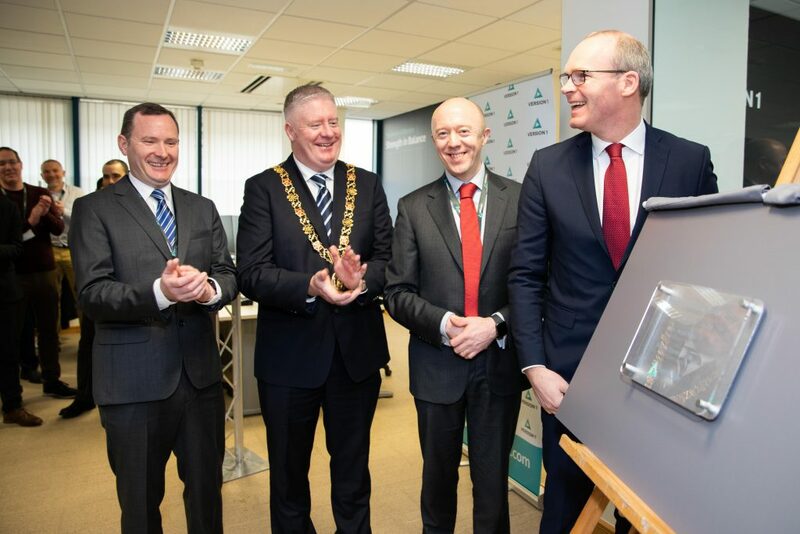 The new office was officially opened by The Lord Mayor of Cork City Mick Finn and An Tánaiste and Minister for Foreign Affairs and Trade Simon Coveney TD. The new office at Lapp’s Quay will allow Version 1 to increase its workforce to 75 technology professionals by 2021 in the region. The expansion will support the Irish company’s continuous growth strategy and help provide enhanced Digital and Cloud services to its customer base in Cork and the wider Munster region. Local customers include The Department of Transport, Tourism and Sport, Laya Healthcare, Musgrave Group, Bord Gáis Energy, DePuy Synthes and The Irish Cattle Breeders Federation. Version 1 employs over 1200 people across its 10 office locations in Ireland, the UK and India, with 800 of its employees based in Ireland. The 40 new roles in Cork will be created over the next 24 months and will include opportunities for experienced Digital and Cloud IT professionals and technology graduate roles. Version 1’s Munster office is led by Cork native, Alan Crowley, who is Head of Delivery in the region with responsibility for leading teams of the company’s specialist consultants to deliver business value through IT innovation with a particular focus on Digital and Cloud services. Join our growing Cork Team – register your interest today!